From the event planner tasked with planning smaller, local and less frequent events, to the venue coordinator tasked with attracting large scale conventions, conferences and seminars to your venue, and all the many other types of industry providers in between - together we are known as 'event professionals'. Conferences, seminars and meetings, oh my! As those who work in the events industry every day - we know that there is no shortcoming of events that take place throughout the year to help build powerful and valuable networking opportunities. 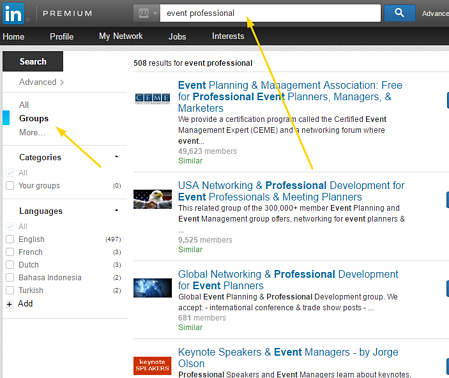 But where does an event professional go to find relevant events for their industry? SmartMeetings has a great resource of events that are happening all around, all year long, that are perfect for anyone in the events industry. ConventionNation provides not only a great resource of event listings, but past attendees reviews and experiences. BNI – Business Network International – Priding factors include having nearly 200k members and 7500 chapters worldwide. Sandler Training - Sandler dominates the global training market through an unparalleled network of more than 250 offices worldwide, with professional trainers providing more than 450,000 hours per year of instruction in 23 languages. MPI (Meeting Professionals International) - Professional membership organization for corporate, association, and independent meeting planners. SPIN(Senior Planners Industry Network) - The world's largest association of senior-level planners. Don’t forget, however! Your exact industry and or profession may be more specific than just event planning and/or event professional association groups. Don’t forget to think outside the box when doing a search for associations relevant to your trade. Odds are if you are located in any decent metropolitan area, there is a local co-working office. These unique and affordable environments allow not only a potential to showcase your expertise should you require a meeting room – but also can help you connect with other business profiessionals in your area that you may not otherwise always connect with. By performing a simple Google search for ‘CoWork + Your Location’ you can find the opportunities available to you. Similar to LinkedIn, just merely do a search for your relevant network/niche and you will be shown relevant groups to you. Already part of a group on LinkedIn or Facebook? Ask your community that you are connected with if there is any additional communities they would recommend you become affiliated with based upon your niche/industry/title. Often times when we think of networking, we think we must completely reinvent a wheel that doesn’t need to be reinvented always. Odds are, every event professional has some type of list of contacts and networking partners that can help us more than we realize. By simply engaging and connecting, on a ‘human to human’ level (i.e. don’t send an automated, generic email to your 300 contact list) with those we are already connected with, can bring great opportunity and rewards! Don’t be selfish! If you are reaching out to ask for potential opportunity clients and/or networking, perhaps provide a similar level of exchange and or contact that would help to whom you are reaching out to, as well! Wherever you may be located, there is always opportunity for volunteering. Whether it’s serving on a public board or commission, or it is serving soup at the local homeless shelter – volunteering can provide a great opportunity to meet other professionals to network and engage with. You’d be shocked at who you will interact and come across when volunteering – and because of your commitment to helping, you’ve built a trust that speaks volumes when nurturing this potential networking opportunity. There are countless opportunities and experiences to network as event professionals should we just merely put on our game face and be confident enough to engage. Looking to have event attendees engage at your next conference or event? MeetingPlay’s mobile event app is built for customized options to leverage engagement and encourage attendee networking.